Another month draws to a close. The last Thursday of August 2015, and it’s time for our Gratitude Circle post. In the moment that we give thanks, everything changes . . .. . . Our hearts crack open. We are flooded with love. And in that exact instant, we shift to an awareness that is positive, joyous, and brimming. Sharing uplifting stories that travel from the beginnings of life to the end, Living a Life of Gratitude shows you how to open your heart to a journey of reflection that will help you slow down and appreciate life for what it is. Whether you use it as a source for discovering inspiration or for strength in times of struggle, this book is a guide to finding light and love, even when you least expect it. Spiritual teacher and intuitive Sara Wiseman is the author of six insightful books on spirituality and intuition (including the new Living a Life of Gratitude: Your Journey to Grace, Joy and Healing; Becoming Your Best Self: The Guide to Clarity, Inspiration and Joy; Writing the Divine: How to Use Channeling for Soul Growth & Healing; and Your Psychic Child: How to Raise Intuitive & Spiritually Gifted Kids of All Ages). She hosts the popular radio show Ask Sara, and is a top contributor to DailyOM. She has released four healing music CDs with her band Martyrs of Sound. Visit her online at www.sarawiseman.com. Here’s an excerpt from the book – a rather strong appeal to live in the moment and be grateful for what we enjoy – now! What if everything you might consider as your life’s purpose was nothing? What if all your accomplishments, when you arrived for your reckoning in heaven, nirvana, beyond the veil, wherever you believe you are going … what if these were taken out and examined and found to be nothing—no longer shiny and bright but drab and shabby, as if collected and carted in an old grocery bag. What if they were looked at—all your pretty things—and then discarded to float away on the breeze, the bright white tail of one particularly favorite accomplishment sent flapping, pale and gentle as a kite rising. Everything taken out and looked at and discarded, until when you reached the bottom of the bag, there was nothing left. Nothing counted enough to be considered your finest accomplishment. Nothing counted enough to be considered your finest achievement. Your whole illustrious, successful, important, rewarded life, was determined a wash. Nothing counted. You arrived with nothing. And still they let you in. There may or may not be a pearly gate to heaven’s door, guarded by St. Peter. There may or may not be a time of reckoning, with points tallied up and sins examined under a celestial microscope. It is your choice to believe in this version of the afterlife or not—for really, what does anyone know? Few have crossed the line, and returned to tell. And what they do tell: of white tunnels, bright light and angels, doesn’t seem to have cover a ledger in the clouds for naughty or nice. When you lift off from the idea of right or wrong, good or bad…when you take the punitive moralistic views out of the equation, and focus instead on heart’s opening into compassion, into connection, into love … this becomes the true measure of our lives. Not what job we had. But how much we cared for others. Not how much money we made. But how much we loved. Not how many trips we took. But how much we enjoyed. I do believe that there’s a strong connection between love and gratitude, and I hope to explore that more in the months ahead. For now, here’s my list of gratitudes for August 2015. A wonderful celebration of my birthday – my 50th – quiet, meaningful and just the way I like it. A spate of visits, phone calls, e-mail greetings, Facebook wishes and some lovely gifts. A two-week long back ache that prompted me to have long overdue blood work done. Blessed to find that all the results came out just fine. Thanks to my cousin’s connections we have a good doctor on board too. Great food – and the discovery of some good eating joints. Enjoying my writing here and on Write Tribe and making meaningful connections with a lot of other bloggers. Even though I couldn’t keep up with writing every day, I made some great blogging pals this month. Feeling the lifting of the darkness that was surrounding me for a while and having the courage to acknowledge and talk about it during that time. Having the spa we had a membership with in Mumbai opening a branch in Hyderabad and allowing us to continue our membership. Back to our regular massage routine and enjoying it. Thanks, Four Fountains! The things I often take for granted – mobility, sight, hearing and overall good health. The generosity of a dear aunt – allowing me to pay forward to causes I believe in. The time and the means to reach out to the less fortunate in a small way. A dog who makes us smile every single day! Incidentally, he featured in a SheKnows.com slideshow! As always the love and support of my dear husband, who puts up with my madness and allows me to be myself. What are you grateful for in August? I’m also linking to Ten Things of Thankful. A beautiful way of being grateful with all the simple blessing that we have will definitely change our life. Thanks for sharing. Great Post. It is, Laurel. Thank you for stopping by. Such a lovely list to be grateful for! Thank you for sharing the book, Corinne! Happy birthday to you! What a great list of things to be thankful for in your birthday month. Thanks for sharing the info about that book – looks good! Gratitude! So vital to a less self-centered life! The was a great post (as usual). I’m grateful we didn’t have scorching heat this summer although the cooler weather did make swimming a chilly endeavor!! You’re right about gratitude, Nan. It keeps me sane! Happy Birthday and lovely list of thankfuls. Happy birthday! Dogs make me smile, too! Thanks for stopping by! Loved your TTOT post! It is, Shilpa. Thank you! It is, Kim. Thanks for coming by! Hi Corinne! Welcome to the TTOT! A happy belated b’day, and I hope that you enjoyed yours. I hope that the back is feeling a lot better! I am always grateful for my dog, even at the times I’m irritated to be tripping over him. Oh I know just what you mean, Vanessa. Thanks for stopping by! 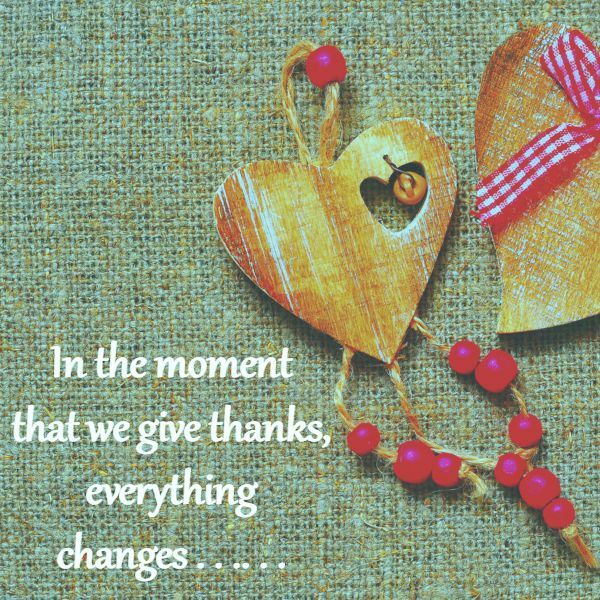 “In the moment that we give thanks, everything changes . . .. . . Our hearts crack open. We are flooded with love. And in that exact instant, we shift to an awareness that is positive, joyous, and brimming. ” – That is true and I have experienced it. Such a simple thing, but it does leave a very profound impact. So glad that to know that you had a great bday. 🙂 Hope you are feeling better now. Wonderful list! I hope you are feeling well. It seems you make wise decisions in caring for your health. And I am glad, because you are an asset to the world, my dear. Thank you, Darla. Your comment made my day. I must take much better care of my health though! I am grateful every day of my life for all my blessings. I love your image for this post, too! That’s a fantastic way to live, Carol! Glad you liked the image too! Happy 50th Corinne! It sounds like you have an amazing life and much to be grateful for. But isn’t it always like the chicken and the egg question? Which comes first? A great life for which you are grateful or being grateful and a life that reflects that in every way? Ah! Interesting question, Kathy. I would say that I’ve always had a good life, but gratitude has made me see even the not-so-nice bits in a new way, allowing me to enjoy life even more! I found that line a call to live in the present moment! SMART alright! Thanks for stopping by and for your wishes! Hello Corinne – I am here from the MidLifeLuv linky party. Beautiful post. Has a lovely warm glow. Gratitude is definitely transformational. Thank you. Glad you liked it, Gilly! I enjoyed reading your post too just now! My gratitude list just multiplied reading yours! So happy that August has been a fulfilling month for you, Corinne! Stay blessed! Thanks a lot, Vidya! I’ve had a great month! I am just beginning a much needed vacation and so grateful to have a week off spread out before me like a banquet! Thanks for reminding me to be grateful and in the moment! A gratitude practice helps pick up the little things I’m grateful for. Thanks for stopping by, Jennifer. That paragraph was quite something… I mean, it got me thinking of all the things people do here on Earth just to make more money or become more famous. Conversely, there were those who avoid doing things they see as bad… what if heaven still welcomed you irrespective of the person you are? What if it forgave you for who you were on Earth. As for the gratitude list, I wanted to do one last month and missed it. Atleast let me try to make a list for this month. Yes, the paragraph kind of shook me up too, Roshan. I guess the secret is to live meaningfully in the present moment and heaven will take care of itself! Looking forward to reading your gratitude post. This linky remains open for a whole month. I am most grateful for my good health and make sure I don’t take it for granted but eat right and exercise daily and get regular checkups. My health makes it possible for me to travel which is my greatest joy in life! Thank you for sharing, Kay! I need to follow your example! Wow! That is very powerful! It was beautiful! Great list Corinne! Especially, good health reports and continuing membership to the spa 🙂 Nice book by the way, thanks for introducing it to us. Thanks, Mahati. Yes, the Universe is truly abundant. Do consider joining our Gratitude Circle. Lovely post, beautiful things to be grateful for. That excerpt is awesome and tells me about the true meaning of life – the how we did it part vs. what we did. Loved it! 🙂 Thank you for sharing! Thanks, Parul. I’m sure you have a wonderfully long list too. Do join in with your post!